Shown here is the Q-series Covert OWB Holster. Do you see what I mean though? Talk to 10 different shooters, and it’s possible they could give you 10 different firearm lubricants that they all believe is the best. There are some incredible lubricants out there these days with the way the technology has advanced. Most definitely some are better than others. But at the end of the day, lube is lube. The number one thing is to make sure you actually use it. Even if you’re using the cheapest stuff out there, chances are you’ll be all right as long as you keep your firearm well lubricated. But what about your holster? 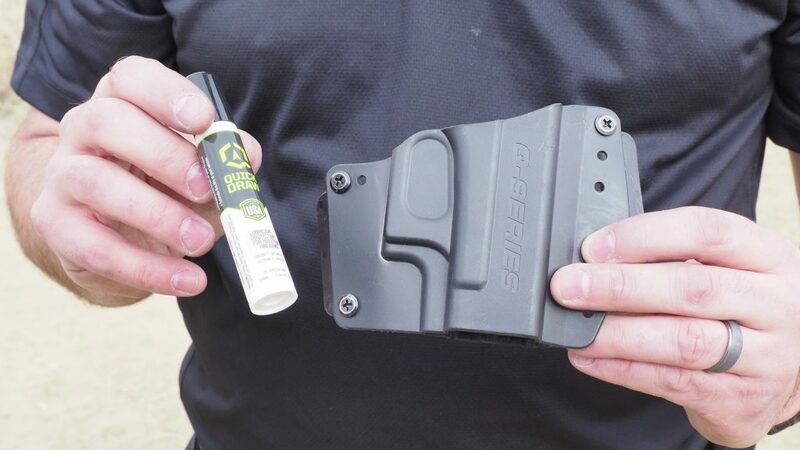 Do you lubricate your holster? Should you? Competition shooters have been using lubricants—especially silicone—for years on their holsters looking to get any possible advantage that they can. What about your defensive holster? Should you lubricate it? Do you need to? A sticky holster when it shouldn’t be. An inconsistent holster—meaning the draw stroke speed can vary from draw to draw. A third thing that doesn’t necessarily bother me, but I know it irritates some of you out there, and that is a holster that wears through the finish of your gun. The reason this doesn’t cause an issue for me personally is because any gun that I put in a holster is viewed as a tool. My tools are meant to be used, not abused, but some wear and tear on the finish is expected due to proper use. Any gun that I have—and they are few—that is nice enough to where I am concerned about protecting the finish is a gun too nice to put in a holster. But that’s just me. Regardless, I’m not going to complain about a product that helps keep my firearms looking newer longer. And I’m certainly going to appreciate a product that facilitates faster, better, more consistent use of my guns. 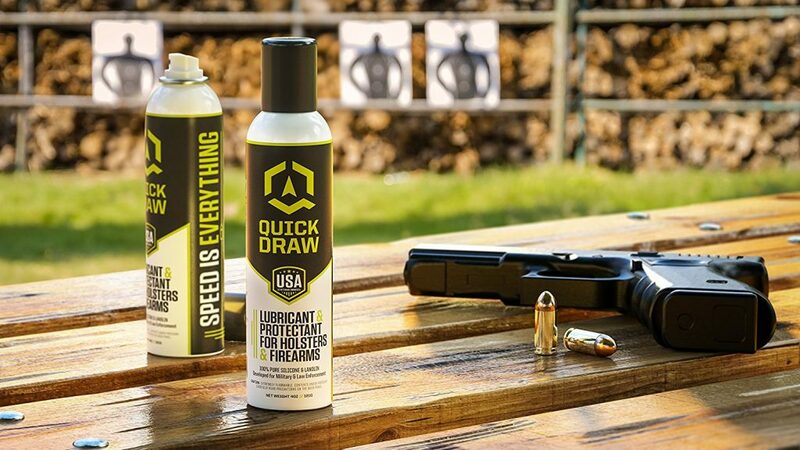 Enter Quick Draw—the lubricant and protectant for holsters (and firearms). Quick Draw is a silicone-based lubricant that also contains lanolin. “Wait. Lanolin did you say?” Yes, the lanolin penetrates and helps protect the metal of your firearm and holster while helping Quick Draw to stay on the holster for longer lasting use between applications. Silicone, of course, is a common lubricant used in a variety of applications and known for its resistance to drying out as it is not water-based. It is better to use in some applications as well where an oil-based lubricant might react with certain materials and plastics to cause degradation. Safe to use on any material—metal, wood, plastic, leather, nylon, etc. Personally, I like a holster that retains a handgun where it is supposed and doesn’t try to retain where it shouldn’t. This is a common cause of inconsistencies and hangups in your draw stroke. What I mean by this is that most modern kydex or polymer holsters are designed to “clip” onto the trigger guard of the handgun—a few lock on to a rail-mounted flashlight. Some are more positive than others, but the point is that those are supposed to be the parts of the holster that actually retain the gun. You don’t necessarily want any other part of the holster to add friction to the act of drawing the gun that’s not intended to. Holsters get used. They get worn. They get dirty. Even a very small amount of dirt or other micro-debris can increase friction in other areas of the holster. This adds great resistance to getting the gun out of the holster, and most of that is added AFTER you have already overcome the main retention device of the holster. This only serves to slow down your draw after you’ve already determined to remove the gun from the holster and need to use it immediately. Quick Draw fixes that. One quick spray inside the holster and I will typically wipe it around the inside of the holster with my fingers or a small cloth. 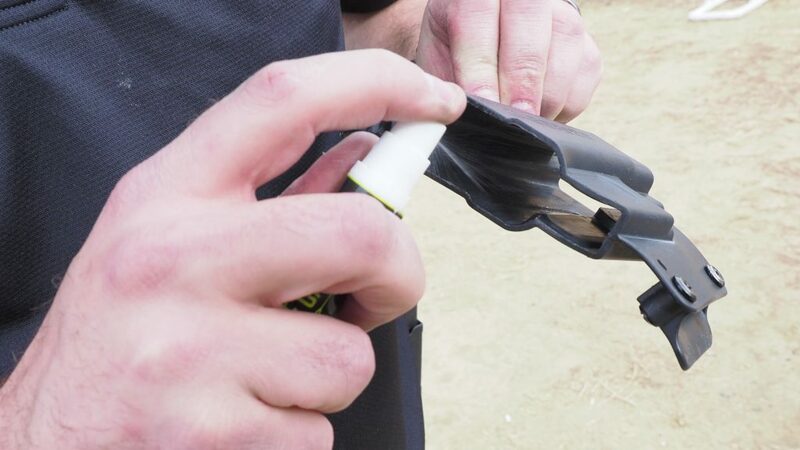 This serves both to clean the holster of any dirt or debris while also lubricating it thoroughly and evenly. As mentioned above, Quick Draw also reduces static electricity which means less dust will be attracted to enter the holster again after it’s been treated. After applying Quick Draw, I then adjust the tension of the holster. Most modern plastic holsters these days have adjustable tension. If not, then I may use a heat gun (in the case of kydex) to make minor adjustments to the depth and shape of the material until I achieve the level of desired retention. I think it is important to adjust the tension ONLY after you have lubed it adequately with Quick Draw. The lube is good enough that once you adjust the tension of the holster, you are left with a “true” measure of tension. There is no other friction added to the holster at this point other than what is supposed to actually retain it. This is what is meant by “improved tactile feel.” Because you’re feeling the mating of the gun and holster the way it was meant to be. It’s a good feeling! Obviously, less dust and dirt inside the holster means fewer opportunities to scratch and wear on the finish of the gun. Your gun will look nicer longer. It will be less likely to rust and pit. Quick Draw comes in handy, pocket-sized 1-ounce spray bottles and larger 4-ounce spray cans. So there’s a size to suit most people and situations. I carry a couple of the small 1-ounce bottles in my range bags. They are handy, and even though I’ve applied Quick Draw dozens of times, I have yet to run out. In practical use and testing, I timed myself drawing from a couple of holsters that were known to be particularly “sticky.” My average draw to first shot times were about 1.1 seconds. But after treating these holsters with Quick Draw I saw my draw times drop to about 0.9-0.95 seconds. It may not seem like much, but even just a tenth faster in time to get the gun out of the holster and on target can make a difference whether at a sanctioned-USPSA match or in a life-or-death encounter. I highly recommend Quick Draw and would encourage you to at least check it out. It is reasonably priced at around $13.95 and $19.95 for the larger 4-ounce can. I think you’ll like it! Meh….seems gimmicky to me. How about just wipe out your holster a couple times a month and clean your weapon. As opposed to “lubing” your holster and mag wells. I use Kydex for all my holsters both competition/range use and concealed carry. Once a month I wipe out my concealed carry holster and visually inspect it and it’s good to go. The competition holster usually gets wiped down before every match. Never had any problems.